We are pleased that you are interested in studying as an exchange student at Alanus University in Alfter. On this page, you will find all important information regarding exchange. An overview is also available in the Fact Sheet for International Students. In order to study as an exchange student in Alfter, your university must be an official partner of Alanus University. Please inform your department about your plans. The department will then contact the International Office at your home university. If the plan is approved, the International Office at your home university will inform the International Office at Alanus University. Do not complete the application form until the International Offices of your home university and Alanus University are in contact. The application form, “Application Exchange Students” is available under Downloads. Applications for the Spring Semester (beginning in April each year) must be submitted no later than the 15 October of the previous year. Applications for the Autumn Semester (usually beginning in mid-September each year) must be submitted no later than 15 April of the same year. The application form, “Application Exchange Students” is available under Downloads. A degree programme in Germany is expensive. The cost for rent, food, insurance, clothing, leisure activities, books, internet, and transportation amounts to at least 750 euros per month. International students must already prove that they have sufficient financial resources when they apply for the visa and the residence permit. The German authorities currently require proof of 8,640 euros per academic year. You can search the DAAD Scholarship Database for funding opportunities. Please also ask at your home university about funding options and scholarships for studying abroad. Students from partner universities who do not receive financial support from their home university can be supported by Alanus University through a STIBET Contact Scholarship. If you are interested, please contact the International Office. Information on current visa regulations is available on the website of the Federal Foreign Office. Exchange students require a “visa for study purposes”. A valid passport is required to apply for a visa. Apply for a visa early, as processing can take several months. Without a valid visa it is not possible to enter Germany. Students must first complete the standard enrolment process at the university in order to apply for a residence permit for study purposes. All international students require valid health insurance in Germany. This is a requirement for enrolment and a residence permit. Statutory health insurance from the following countries is recognised in Germany: Member countries of the European Union, Bosnia-Herzegovina, Iceland, Israel, Liechtenstein, Morocco, Macedonia, Montenegro, Norway, Switzerland, Serbia, Tunisia and Turkey. Private domestic or international health insurance from other countries may also be recognised in Germany – details must be clarified with the insurance company in the home country. If the insurance from the home country is not recognised, students in Germany must apply for health insurance. The International Office can advise you on this topic upon request. 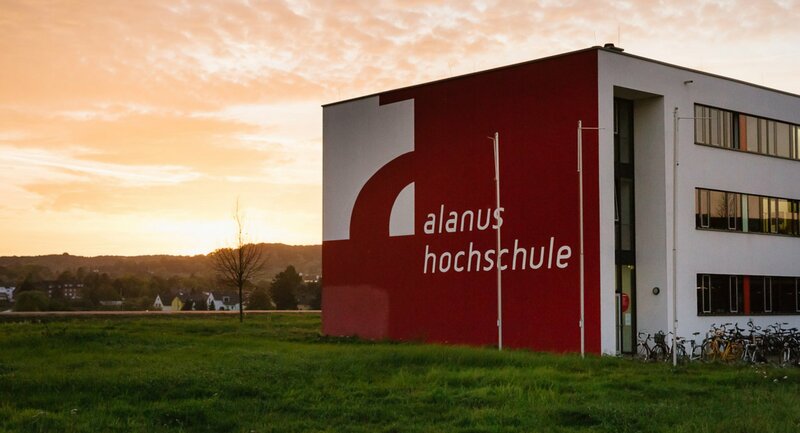 Your exchange to Alanus University is organised, and you are looking forward to an exciting stay in Germany. Only one thing is missing: suitable accommodation? Whether you are looking for a room in a student housing, a single flat or a shared flat, all the important information you need on the topic of living in Germany as well as information on various accommodation options is available on the following page. Please note that the International Office does not arrange flats or rooms directly. However, you are welcome to create a seeking-accommodation notice, which we will gladly post for you. Anyone moving into a flat must register with the local Registration Office (Einwohnermeldeamt) within two weeks of moving in. More information is available from the DAAD. Many opportunities for leisure activities are available at Alanus University and in Alfter. Any student can participate in university sports for a registration fee of 25 euros per semester. Options range from football and badminton to Zumba, yoga and gymnastics. Every Winter Semester the university choir rehearses on Mondays from 5:30pm to 7pm under the direction of Andrea Heidekorn. Choir season ends with a performance at the Christmas party. Alfter has a community garden, which is jointly maintained by students. If you are interested in gardening and cosy campfire evenings in the countryside, you are welcome to participate. The Student Council is open to all students of Alanus University. Its mission is to serve as a central contact point for student issues and concerns. It supports initiatives that contribute to improving student university life in general. The Student Council is also committed to community building and interdisciplinary exchange. During the lecture period, the Student Council meets every Monday at 7:30pm in the office building at Hertersplatz (1st floor). By registering at studierendenrat@alanus.edu, students can participate in the Student Council meetings and present their own concerns and interests for joint discussion. At least once per semester, the Student Council, after consulting with the university administration, organises a General Meeting at the university. The meeting serves as an opportunity for lecturers, students and staff to discuss university matters jointly. No other events take place during the University Meeting. Every semester, the International Office offers a cultural programme for international students. We organise hiking trips, museum visits, city tours, cooking evenings, and even a few festivals. At the events you have the chance to gain insight into regional culture, meet other internationals, and share your experiences. An overview of the entire cultural programme is sent out at the beginning of the semester and posted on the notice board. Invitations to the individual events will be sent to you in advance by e-mail. The cultural programme is sponsored by Stibet and is therefore free of charge for international students. For more information, please send a short message to study-buddy@alanus.edu and subscribe to our mailing list. Applications are accepted on an ongoing basis. If you are interested, please contact the International Office.